The SOUNDTAG lab from SMRU & CREEM participated together in Science Discovery Day as part of the British Science Week 2018. Danielle Harris, Popi Gkikopoulou, Marco Casoli and Filippo Franchini presented activities relating to marine mammal acoustics and density estimation from acoustics. How do whales and dolphins use sound? Learn about whale song, whistles and clicks of dolphins, and how these sounds are connected to communication, searching for food and moving around in the dark blue sea. Can you mimic a dolphin? Also discover how scientists use sounds to count whales and dolphins. This entry was posted in Outreach and tagged marine mammals, outreach, SMRU, SOUNDTAG on March 13, 2018 by kg366. The range and diversity of sensors and how they can be utilised effectively. Reconstructing animal tracks from tag data. Statistical analysis of tag data. Practical sessions provided participants with the opportunity to apply what they had learned in lectures to real tag data and a toolbox of custom made tag tools for data analysis in MatLab, R and Octave was made available. On the final day participants had the opportunity to play with some of our own DTag-4Seal tags and collect and analyse their own data from free ranging Homo sapiens! Group members were ‘tagged’ and challenged with working out what activities other groups had performed based on the accelerometer and magnetometer data and using what they had learned during the workshop. This 3 day workshop was hugely informative and will no doubt benefit the future research of all who took part! A one day version of the tag tools workshop is set to run at the 22nd Biennial Conference on the Biology of Marine Mammals, Halifax, Nova Scotia on Saturday 28th October 2017. Places are still available so to be sure to secure your place for this valuable and informative workshop. Visit www.animaltags.org for details of future courses and to access course materials and the new tag toolbox! This entry was posted in Uncategorized on September 4, 2017 by hmv. This entry was posted in Outreach and tagged cetaceans, outreach, science festival, sound, tags on November 30, 2016 by kg366. Downtown Documentary screening, 6th of October at Buchanan Theatre, St Andrews. Sonic sea is a documentary about protecting life in our waters from the destructive effects of oceanic noise pollution. We had the great opportunity of of sharing the documentary screening with the public of St Andrews and engaged in an interesting Q&A session with Catriona Harris, Patrick Miller, Len Thomas and Mark Johnson. This entry was posted in Outreach on November 30, 2016 by kg366. Members of the Sound and Movement Tags Lab participated in an outreach event at the Dundee Science Centre as part of their Animal Day on Saturday 13th February (it was World Whale Day). “The Biggest Nose on Earth” saw lab members presenting information on the Sperm Whale, Echolocation, Tags as tools to study whale behaviour, and Conservation. Members of the public were able to see if they could click as loud as a sperm whale, listen to sperm whales, age a sperm whale using the layers in its teeth, and hit a target at different distances using water jets with narrow and broad beam widths to explain why the nose of a sperm whale is so important for generating echolocation clicks and focussing sound. We had a good foot fall and many budding young scientists and their parents enjoyed interacting with the display and lab members. This entry was posted in Outreach, Uncategorized on February 16, 2016 by mcrs. European Researcher’s night celebrated its 10th anniversary on 25th of September 2015 in more than 280 cities across Europe. Sound & Movement Tags lab participated in the event with activities for hunting and communicating with the use of sound and surviving in extreme polar conditions. Together with other activities from different departments of the university, the event took place in the Medical School Building in the North Haugh. More than 250 people attended the event and we are looking forward to participate again next year! This entry was posted in Outreach on January 4, 2016 by kg366. How do marine mammals communicate and hunt? What techniques do researchers use to follow marine mammals? 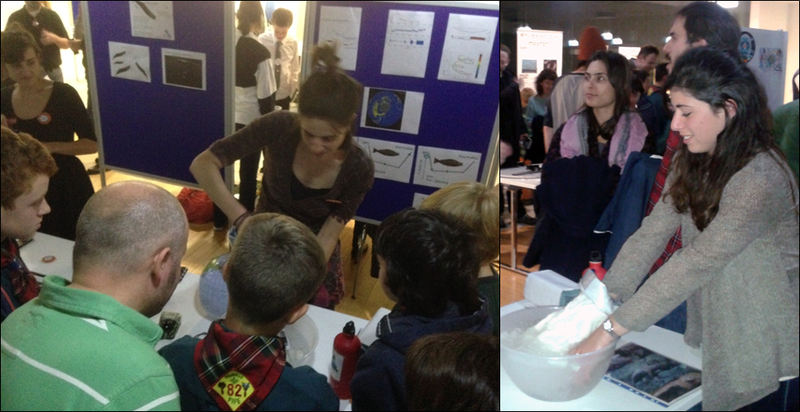 Start Science Masterclasses of the Royal Society of Edinburgh, organized a class in St Andrews held by Meriem Kayoueche-Reeve with theme “Mud and Marine Mammals”. The Sound and Movement Tag Lab participated with activities related to marine mammals hunting. S1 and S2 students had the opportunity to go through the different feeding strategies of varied marine mammal groups and play with a sound production model describing the basic functions of echolocation. This entry was posted in Outreach on December 15, 2015 by kg366. The SOUNDTAG lab member, Victoria Warren, has presented her work on DTAG in the 29th ECS Conference in Malta (2015) under the title: “The short-term responses of sperm whales to the attachment of suction-cup tags“. Victoria gave a talk in which she explained the impact of tag attachment on the animals. Tag attachment could be detected within dive parameters such as dive duration and foraging effort. This entry was posted in Uncategorized on April 3, 2015 by Cristel. This entry was posted in Media on March 31, 2015 by Cristel. ‘How Whales Sing for Their Supper’ was the name of our exhibition in Scottish Fisheries Museum, Anstruther. It was held on Saturday 15 March, 10am – 2 pm. This entry was posted in Media on March 21, 2014 by si9.